Easter is only weeks away, so if you’re a local business who counts on a windfall during this holiday, don’t leave your success to chance. Harness the power of hyperlocal outdoor advertising to ensure you get the boost your business needs in April. When it comes to retailers who typically do well at Easter, it’s surprisingly not all about chocolate and bunnies. Publications such as ELLE UK put together lists about ideal gifts that don’t include as many calories, which means that more businesses than ever can benefit from the holiday. 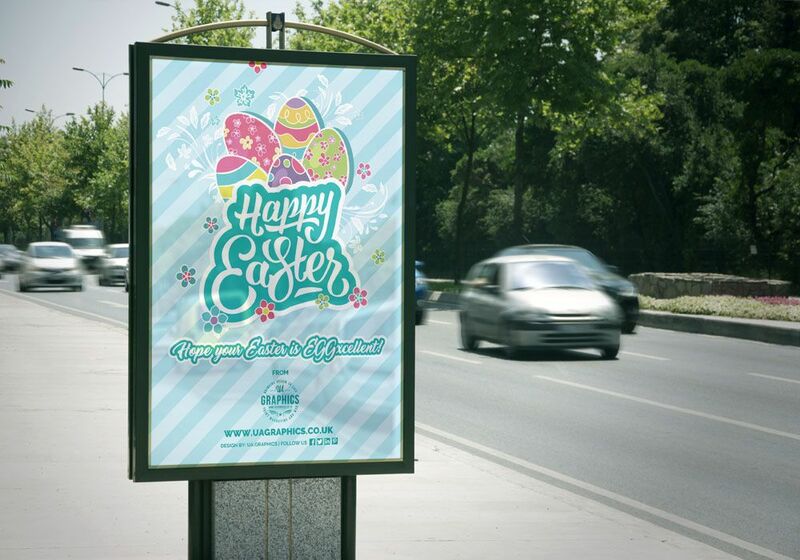 There are so many industries that can benefit from the Easter holiday by ramping up advertising in Spring. From bakeware suppliers to craft stores, high-end boutiques and local food retailers, Easter advertising is for everyone! Brands such as Trolli, The Co-operative, Aldi, Tesco’s and Cadbury make the most of Easter advertising by appealing to the feasting nature of the holiday. Just because those big names are doing it, doesn’t mean can’t too – because with Bubble’s outdoor advertising marketplace, it’s more affordable than ever to compete with the big boys. There are so many products that people don’t even know that they want. Easter Egg waffles from the local cafe, Easter-themed events and even rabbit themed napkin rings, lamps, coat hooks and more. There’s no limit to what could go gang-busters at Easter, the trick is how you’ll inform your target audience. Outdoor advertising is a medium that works hard for those that decide to harness its power. With OOH, buying well enough in advance is key. There are only so many sites in the immediate area surrounding your retail space or ideal targeted geographic location. That’s why you have to think strategically about where and when you advertise. Bubble was designed especially for this. With one glance at the intuitive Bubble map, you can see what spots are available for the specific time period (i.e. the weeks leading up to Easter), what size and dimensions you can choose from in that area and how much the whole campaign will cost. Bubble was made for small businesses because not every company has a budget like Cadbury. You can choose where and when you advertise and you can even set the filters on Bubble to ensure you’re keeping within your budget. When thinking about hyperlocal campaigns, as you would be when running a targeted approach to your Easter push, you need to consider the audience in your immediate vicinity. The point of the whole campaign is to drive people into your store and raise the profile of your brand. You don’t need a massive budget to do this. Phonebox ads are a great way to dip your toe in the OOH market, as well as an effective way to drive sales, brand awareness and promote special offers. The average value of gifts received by UK kids at Easter is £56, so the market is definitely there to achieve success. The beauty of OOH is that you can add your phonebox, digital shopping centre spot or 6 sheets to your ‘always on’ digital approach, easily. Outdoor advertising combines perfectly with other marketing assets, which means you can use other formats to simply reinforce your message. OOH alongside digital (or any other medium) is so much more powerful than one format alone. The simplest way to measure the effectiveness of your Easter campaign is to look at a metric such as sales. Look at the impact before and after. If there’s a noticeable increase, I’d hesitate to guess that OOH will never again be the missing piece in your overall marketing strategy. So if you can’t find the location, OOH type or campaign period that you need, just utilise Bubble’s planning service to make the most of Easter sales.